Finding information about the matles test is best done by searching databases such as PubMed and Web of Knowledge. There are also several websites (e.g.this one) on which one can find similar information, although this doesn’t provide any certain scientific level of evidence. Keywords or combinations of keywords that proved most successful were: Matles test, achilles rupture, achilles rupture diagnosis, achilles tendon trauma and tendon rupture. Definition: The Matles Test is a visual diagnostic test for suspected rupture of the Achilles tendon. Description: The patient lies in prone, active or passively flexing the knee to 90° with both feet and ankles in a neutral position according to the patient. When an absence of plantar flexion is observed, the test proves positive. The rupture will tend the foot more into dorsal flexion. The Achilles Tendon consists of the tendons from 2 major muscles: the Gastrocnemius muscle, a bi-articular muscle that finds it's origin on both the lateral and medial epicondyl and the Soleus muscle, which finds it's origin on the dorsal aspect of the tibia and fibula. Sometimes the Plantaris muscle is also present. This is a small muscle in the Popliteal Fossa facing it's lateral aspect. It has a very long tendon and inserts together with the Soleus and Gastrocnemius muscle on the back of the heel bone (Calcaneus). 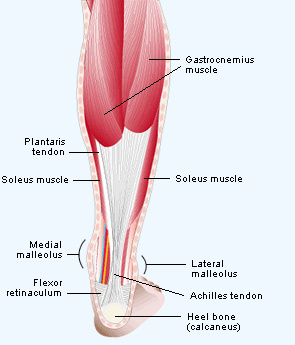 This general insertion is known as the Achilles tendon. If awake, the patient is asked to lie in prone and actively flex their knees to 90°. If locally anesthetized, the examiner passively flexes the knees. The position of the ankles and feet has to be observed by the examiner. An uninjured foot remains in slight plantar flexion. When the patient suffers from an Achilles tendon rupture, the foot will fall into neutral position or even into dorsiflexion. This is often referred to as 'the angle of dangle'. This is an observation test, no further palpation or movement is required. ↑ Schünke M, Schulte E, Schumacher U, Voll M, Wesker K. Prometheus anatomy. Houten: Bohn Stafleu van Loghum, 2005.